Recent commodity price declines have led to increasing concerns that farmland prices could decline as a result of potential decreases in income to farmland. Corn prices, for example, have decreased from over $5.00 per bushel during the summer of 2013 to prices in the mid-$3.00 range during the summer of 2014 reflecting expectations of large yields. During the first half of 2014, farmland values appear to have stopped increasing rapidly, as they did from 2006 through 2013, with some reports of small decreases and softening demand. The purpose of this farmdoc daily article is to provide an analysis of capitalized values of current returns and examine implications for 2014 and beyond. The findings include that current forecasted income, which represents a decline from recent periods’ income levels, is not likely to result in large farmland price decreases. However, capitalization rate increases, which may be commensurate with increases in general interest rates, do pose a larger risk factor. Farmland prices have increased dramatically during recent years. The National Agricultural Statistical Service (NASS) – an agency of the US Department of Agriculture – reports cropland values for many U.S. states (click farmdoc daily August 15, 2014 for an Excel worksheet with data). According to NASS, the average cropland value in Illinois increased from $3,640 per acre in 2006 to $7,700 per acre in 2014 representing an increase of 212% or a 9.58% continuously compounded annual growth rate. (see Table 1). While not providing a completely clear picture, recent reports suggest that farmland prices stabilized during the first six months of 2014, with some reports suggesting slight decreases and others suggesting slight increases. Purdue University reported that land values for average Indiana farmland increased by 7.1% from June 2013 to June 2014, but decreased by 1.9% from January 2014 to June 2014. In its August 2014 AgLetter, the Chicago Federal Reserve Bank (FED) reported that northern and central Illinois land values increased by 3% between April 1, 2014 and July 1, 2014. In the Agricultural Finance Monitor released in the second quarter, the St Louis FED indicated that second quarter 2014 land values were 3.5% lower than first quarter 2014 values in the Eighth Fed District representing southern Illinois and Indiana, western Kentucky and Tennessee, Northern Mississippi, Arkansas, and eastern Missouri. While not identical, none of the reports indicate large changes in farmland prices in the first six months of 2014. The recent performance of farmland prices, and the recent shifts in commodity prices have led to heightened concern about potential future reactions of farmland markets. In evaluating financial markets, it is common to assess the level of income and the risk adjusted discount rate that results in current values of the asset generating the income. While there also are many other specific parcel effects in local markets, the same principles apply reasonably well in aggregate farmland markets where the majority of the valuation impacts can be summarized by changes in the following two factors: 1) farmland returns and 2) risk-adjusted capitalization rate. 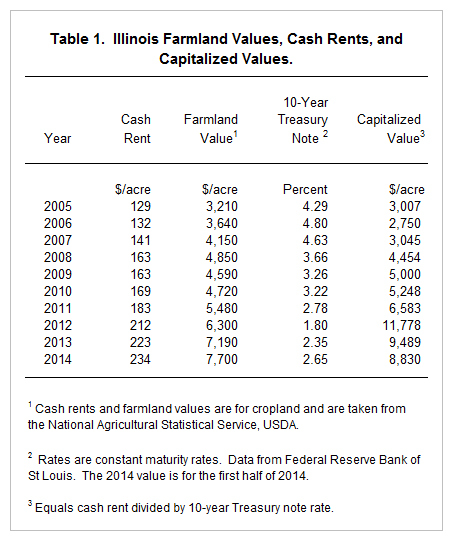 Cash rents provide one meaningful measure of farmland returns. Generally, prospects of permanently increased cash rents lead to increases in farmland prices. Since 2006, average cash rents in Illinois increased from $132 per acre in 2006 to $234 per acre in 2014, representing an increase of 77 percent (see Table 1). Based on past empirical work, a reasonable proxy for the farmland capitalization rate appears to be 10-year Constant Maturity Interest rate. As a proxy for the “cap rate”, changes in interest rates impact farmland prices through two effects. First, lower (higher) interest rates decrease (increase) farm mortgage costs, thereby reducing (increasing) the costs of acquiring farmland. Secondly, lower interest correlate with lower returns on an alternative investments, making other investment less attractive, and vice versa. Interest rates have been on a downward trend since the mid-1980s, with significant decreases in interest rates since 2008 (more detail is available at farmdoc daily November, 26 2013). In 2008, the rate on a 10-year constant maturity U.S. Treasury was 4.63%. In 2012, the rate was 1.80% (see Table 1). From 1.80%, the rate has increased to 2.65% during the first half of 2014. To illustrate, capitalized values for Illinois were calculated for each year from 1970 through 2014 using yearly average cash rents as the proxy for income and the 10-year Treasury rates as a proxy for the discount rate. 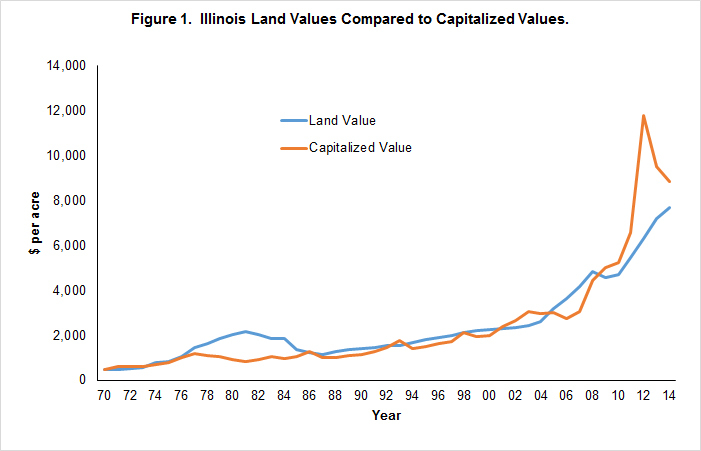 From 1986 through 2006, these capitalized values and Illinois farmland values mimicked each other reasonably closely (see Figure 1). The last time farmland values exceeded capitalized values by a large amount was in the 1980s, signaling that farmland was overvalued relative to its earnings potential, and suggested that a farmland bubble was building. This bubble burst in the mid-1980s. From 2009 through 2014, however, the Illinois capitalized value has been above the actual price, suggesting either that fundamentals support even higher farmland prices, or that market participants did not view all of the increase in income received as permanent. In 2014, the actual farmland value was $7,700 per acre while the capitalized value was $8,830 or $1,130 higher than the current value ($234 cash rent / .265 10-year rate). In other words, current cash rents and the 10-year CMT rate together suggest that Illinois farmland prices are not overvalued. Cash rents may come under pressure in future years. Corn and soybean prices have decreased from 2010 through 2013 levels, leading to lower returns to farmers (see farmdoc daily July 8, 2014 for more). These lower returns will put downward pressure on 2015 cash rents (see farmdoc daily July 22, 2014 for more detail). If low prices persist for several years, downward pressure on cash rents could continue into 2016 and 2017. Of course, a return to higher commodity prices would relieve this pressure. However, cash rent decreases would have to decrease by a large margin and perceived to be permanently lower before implied capitalized values would drop below current farmland values. To illustrate, given the 2014 10-year Treasury rate of 2.65%, cash rent would have to fall below $204 per acre before the capitalized value would decline below the current farmland value of $7,700. A decline of $30 per acre for cash rent from the current $234 per acre level is highly unlikely. Based on the above capitalized value comparisons, decreasing agricultural returns alone likely will not trigger a farmland price decrease. This conclusion assumes that adverse events will not permanently lower farmland returns. Adverse events include reduction in export demand for US crops due to a recession or political uncertainty in China and a steep reduction in corn used in producing ethanol. For the first six months of 2014, the 10-year constant maturity Treasury note rate averaged 2.65%. Given the 2014 cash rent of $234 per acre, the 10-Year Treasury rate would have to increase to 3.04% before the capitalized value equaled the current farmland value of $7,700 per acre. A rate increase of this level is possible (though could also occur through inflation that also increases the value of commodities and puts upward pressures on cash rents as well). An increase in the capitalization rate from 2.65% to 3.65% would result in a capitalized value of $6,411, a value that is $1,289 below the $7,700 current value of farmland. An increase from the current rate of 2.65% to 4.65% would result in a capitalized value of $5,032, a value that is $2,668 below the $7,700 current value of farmland. Since 2008, policies of the U.S. Federal Reserve Bank (FED) have kept rates low. Short-term rates are near 0%. Furthermore, the FED has engaged in several rounds of Quantitative Easing (QE) policies involving sizable purchase of bonds of longer-termed maturities so as to lower longer-termed rates. The FED has indicated that they are attempting to move to more “normal” interest rate policies . If the economy performs as expected, FED purchases of longer-termed bonds will end in 2014, which could eventually lead to higher rates on longer-termed maturity positions. Moreover, many FED policy makers desire increases in short-termed rates, believing that short term rates should be about one percentage point higher by the end of 2015. Of course, increases in rates are far from certain. Indicators could suggest the economy is nearing recession, leading the FED to continue low interest rate policies. Even if more typical monetary policies are pursued, there is uncertainty about the path of interest rates as the FED winds down extra-ordinary policies and their associated enormous balance sheet positions. While interest rate increases are not certain, it appears that interest rate increases that affect farmland’s capitalization rates pose a greater threat to decreasing farmland price decreases than does the prospect for decreases in farmland returns. Of course, the impact of interest rates increases will not only impact farmland prices, but also will put downward pressure on all assets’ values. Interest rate increases will directly cause bond prices to decreases. Because of the same discounting of futures process that impacts farmland values, downward pressure on stock prices can occur as well. During the previous several years, increasing return to farmland and decreasing interest rates have placed upward pressure on farmland price. Now farmland returns are no longer increasing and interest rates may be set to increase. The drivers of large farmland price increases from 2006 through 2013 have likely eased, however, that does not mean that farmland prices will decrease. We may enter a period of more stable farmland prices. Shocks to interest rate markets could result in farmland price decreases, along with pressures generally on other assets as well. Over the next several months, watching actions of the FED and reactions in debt markets could be telling for the direction of farmland prices in the future. Sherrick, B. "Updated Farmland Values and Returns tools - 2014." farmdoc daily (4):153, Department of Agricultural and Consumer Economics, University of Illinois at Urbana-Champaign, August 15, 2014. Dobbins,C. and K. Cook. "A Time of Change? Indiana's Farmland Market in 2014." Purdue University Economics Report, August 2014.
from the Federal Reserve Bank of Chicago, Number 1965, August 2014. Federal Reserve Bank of St. Louis, Agricultural Finance Monitor, 2nd Quarter, 2014. Schnitkey, G. "Management Implications of Non-Decreasing Interest Rates". farmdoc daily (3):226, Department of Agricultural and Consumer Economics, University of Illinois at Urbana-Champaign, November 26, 2013. Schnitkey, G. "Farmland Price Outlook: Are Farmland Prices Too High Relative to Returns and Interest Rates?" FEFO 10-17, Department of Agricultural and Consumer Economics, University of Illinois at Urbana-Champaign, October 18, 2010. Schnitkey, G. "Current Farmland Prices in Line with Farmland Returns and Interest Rates." farmdoc daily (2):165, Department of Agricultural and Consumer Economics, University of Illinois at Urbana-Champaign, August 24, 2012. Schnitkey, G. "Release of 2015 Crop Budgets." farmdoc daily (4):126, Department of Agricultural and Consumer Economics, University of Illinois at Urbana-Champaign, July 8, 2014. Schnitkey, G. "Renegotiating Cash Rents Down for 2015." farmdoc daily (4):136, Department of Agricultural and Consumer Economics, University of Illinois at Urbana-Champaign, July 22, 2014. U.S. Federal Reserve. Minutes of the Federal Open Market Committee. July 17-18, 2014.